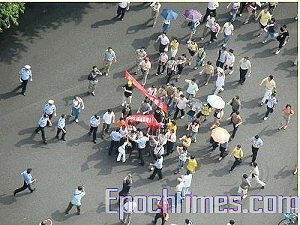 CHINA—On June 1, 2007, over ten thousand people in Xiamen went to the streets to protest the government's attempt to build a paraxylene (1) chemical plant. According to a witness, the Xiamen government went from a tough to a passive and compromising attitude. The government knew about the demonstration beforehand and threatened employees from schools and government institutes not to join in the activity. Local media also received a government notice not to report the activity. There were still over ten thousand citizens that showed up. One of the participants said the demonstration started at 9 a.m. and lasted till 5 p.m. 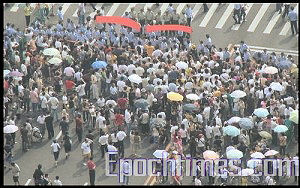 The demonstrators went to the City Hall, Train Station, the Bureau of Environmental Protection, and Xiamen University. Hundreds of people held banners and shouted in front of the Xiamen City Hall, “Protect Xiamen and Refuse Pollution,” “No PX!” (paraxylene). These people were surrounded by hundreds of armed officers. One of the participants said the number of demonstrators reached ten thousand by 10 a.m. Many employees inside office buildings came out and joined the demonstration. Citizens in cars honked their horns to show their support. Many passersby clapped their hands and give out free water to the demonstrators. Around 11:30 a.m., police cars stopped the demonstrators. Several people were injured in the conflict. The crowed shouted “No violence!” The parade finally broke through the road block and moved on. At noon time, the demonstrators gathered in front of the City Hall. There was a stand-off between the armed police and demonstrators. The crowd shouted and wanted He Lifeng, Party Chief of the Xiamen City, to step down. Later there was a press release from the City saying that an environment safety evaluation will take six months and wanting the citizens to express their voice through regular channels. 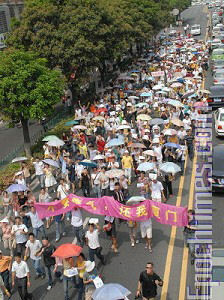 After 2 p.m., two thousand people continued toward the Xiamen University. Many of them were children in school uniforms. Many drivers passing by the parade honked to show support. A student said several days before the demonstration, counselors at high schools talked to all the students asking them not to join the activity. Schools informed student organizations and clubs and forbade students to join the demonstration. A student from Xiamen University said the students received notice from the university that those who went to the demonstration would be expelled. Government employees, Communist Party members, and their family members would be revoked their communist party membership if they joined the walk. Many passersby said the demonstrators were very rational, calm and didn't leave much garbage. The demonstrators kept quiet as they walked by hospitals. The center of the PX project is four miles away from downtown Xiamen and Gulang Island, a national resort, and 2.5 miles away from the Xiamen Foreign Language School and the Beijing Normal University Affiliated High School that has 5000 students. There are over 100,000 residents who live within a three-mile radius of the plant. (1) Paraxylene (PX) is a colorless liquid that is highly toxic.